Good Monday morning everyone! Welcome to a new work week, and we know that you all are probably dragging a little because you got to sleep in over the weekend and basically do what you want. Now, you get to just pour yourself a cup pf coffee, and sit down to a really great optical illusion. We understand how you guys often have to fight your own battles, and this is what inspired us to find today’s optical illusion! Check out this great optical illusion involving this very brave woman who is facing down a mighty dragon. Talk about a strong woman. Take a look at what she is battling this dragon with. 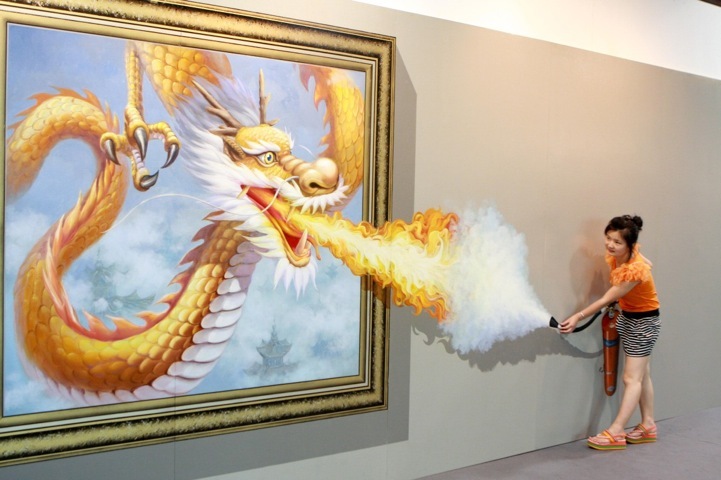 This woman is battling a fire breathing dragon with nothing more than a fire extinguisher! How many of you can relate to this woman? We as human beings often have many battles to fight, so we can all relate to battling a dragon with nothing more than a fire extinguisher. Ready for a very smart, and cool, optical illusion that is made up of human beings? Check out the human brain made up of human beings! Works of art are always in the eyes of the beholder, and this human brain made up of real living people is proof that anything can really be a work of art! Have a great Monday everyone! The question for me, is how is the “illusion” of the dragon’s flame going outside the picture frame done?